Wolf Spirit | Standard Figurines | One Price Low Flat Shipping! From Westland Giftware Horse of a Different Color Collection, Wolf Spirit Clydesdale Horse. Made of hand-painted resin. Measures 6.5" tall. A metal plaque is embedded in the base, showing the title and the exact serial number (out of 10,000). 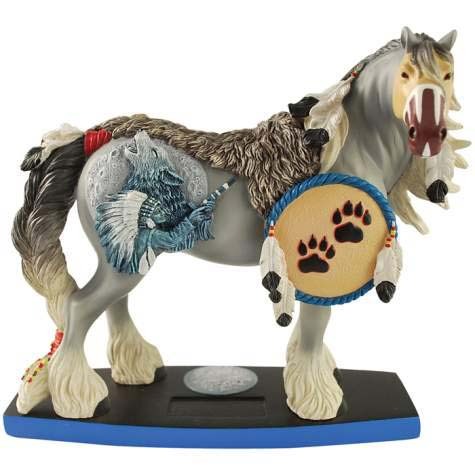 This Clydesdale horse figurine is decorated in a Native American tribal theme with a wolf skin blanket and a shield with paw prints and feathers. Featured in relief are an American Indian chieftain and a wolf howling at the moon. Descended from the massive warhorses of Medieval Europe, the Clydesdale horse is known for its massive size and extreme strength, yet gentile nature. In 1776, huge Clydesdale draft horses were used to pull heavy canon, artillery, and supplies to aid in The War for Independence. Today horses are utilized for parade use, as well as in competition. Colorful, noble, and classic are all words that best embody this exciting new collection, Horse of a Different Color. Whether you are a novice collector or a passionate horse lover, you will find that there's a perfect design from this collection for any home and lifestyle. This kaleidoscope of horses exhibits many breeds, intricately designed and sculpted with beading and bold patterns, capturing the beauty and longevity of one of nature's most beloved creatures. Celebrate the history and grace of horses and welcome Horse of a Different Color into your hearts forever.